I finally did it — I bought an enlarger. And a whole bunch of other darkroom necessities that I happened to find on Craigslist. It was actually three boxes. I spotted the posting when it was less than a day old, and I suspect I was the first serious inquiry. Maybe the first overall. 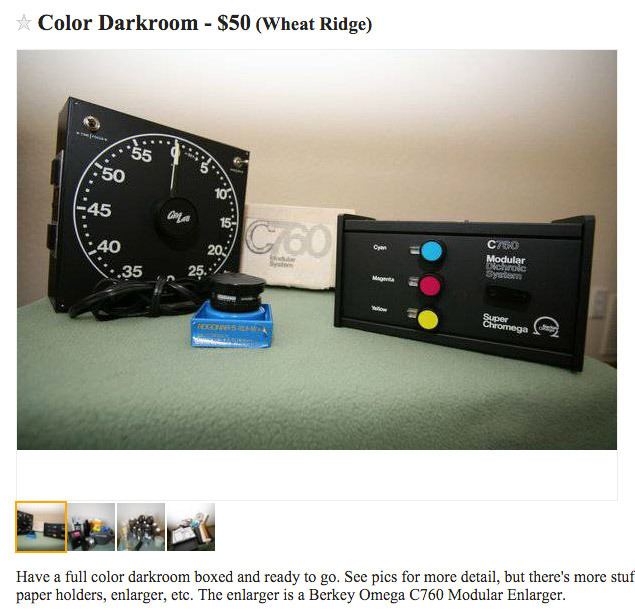 Darkroom stuff does seem to linger on Craigslist, although most of what I’ve been seeing was either too expensive (read: more than most of us film photographers can afford after paying the film bill). It’s also true that people tend to ignore the Craigslist advisory to delete your post once the item is sold. I was a little surprised, actually — the seller was only asking for $50 for the whole schmear. Given what was in the box(es), I imagine a dedicated seller could’ve broken it up and gotten eight or ten times that much. But there’s always a story, of course. The woman I bought the package from had just moved into a new house and space was at a premium. She told me she’d been carrying the stuff around through moves for over ten years. She’d purchased it originally with the intention of making color prints after having enjoyed printing in college, but she’d never really had time or space to use it. I can’t be sure, but it looks like she’d been trying to unload this kit since at least 2006. The whole package was originally purchased in Dallas, Texas, in 1983 — it included the receipt! Original purchase price? Just short of $700. That’s well over $1,500 in 2015 money. So I’m the third owner. The seller had purchased it form the original owner’s widow. I’m not real sure how much use it ever saw, because everything still has its original boxes, although they do show signs of wear. There was even a file folder in one of the boxes containing all the manuals and warranty cards for everything in the outfit. The key thing in this entire kit, for me, was the enlarger itself. 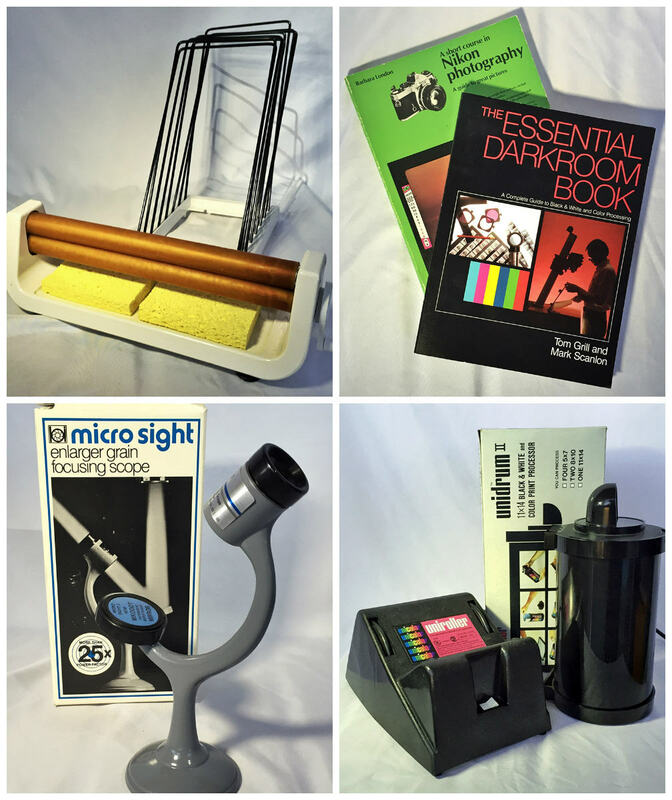 There were a few things I was looking for in an enlarger — mostly that it was very, very cheap. But I also needed to be sure it could do what I wanted and that I could find details and advice if I need them. I Googled the model number and found a lot of discussions on useful forums such as APUG and Photo.net about the Omega C760. I also found manuals, parts and a lot of raw data. I plan on printing black and white — not necessarily forever, but I don’t currently have any plans to learn to print color. Can you print black and white with a color enlarger? The answer is a resounding yes. In fact, it sounds like, with a little extra work, you can use it to take even more control of your prints, though it may be harder to reach extremes of contrast. With two big checkmarks under “Pros” and nothing yet to mark down under “Cons,” I jumped on it. The 50mm lens and 35mm negative carrier don’t do me as much good as I’d like. I have plenty of 35mm negatives I may someday want to print, but it’s the 6×7 work I’m really eager to see on paper. Everything else was really, pretty much, gravy. 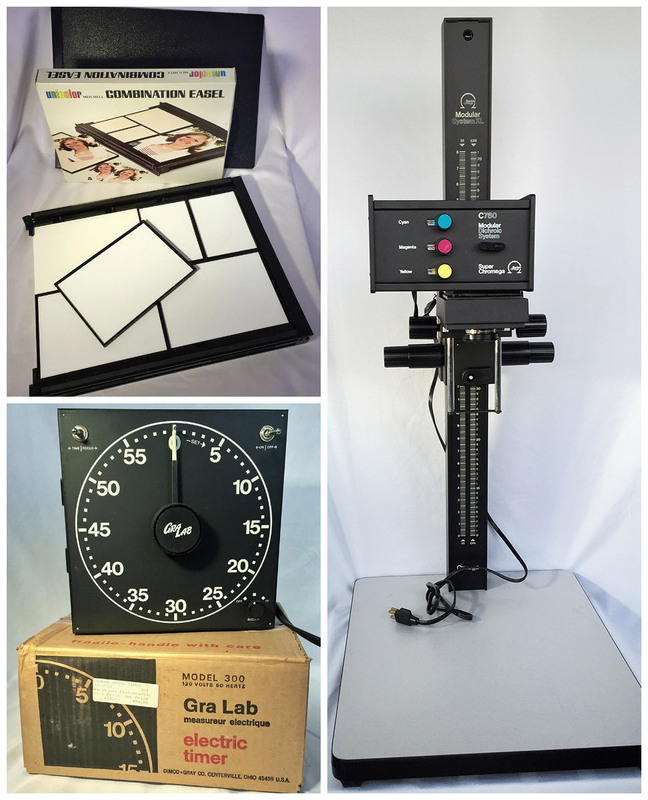 The Gra Lab 300 timer is among the most recognizable features of a darkroom to me. They’re everywhere, and yet, they’re still not cheap. Opinions on their specific usefulness seem mixed, but almost everyone seems to think they’re good for something. 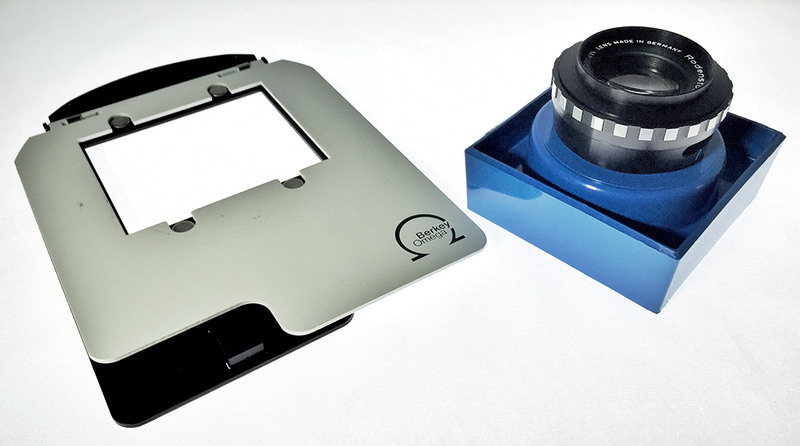 The Unicolor drum system sounds like it can effectively be used for 4×5 film, as well as 8×10 and 11×14 prints. I found what appears to be a very thorough tipsheet so I’m glad to have this option, even though I have a stack of trays ready and waiting, too. The Falcon print dryer system hardly registers on the Internet, but I found one thread that seems to indicate they work pretty well, if only for RC paper. The Microsight grain focuser has moderate reviews on the sites that list it (of course, most show it as currently unavailable). I’m sure it will do just fine for now. The Mitchell combination easels are another item that almost might not exist on the Internet. I found very little about them, although I have the instructions. I’ll give them a try before investing in any other easels, I think. The Durst Coterm chemical heater sounds useful. There are certainly plenty of them for sale, some marked “rare,” although most of the sold listings only went for $25-50. 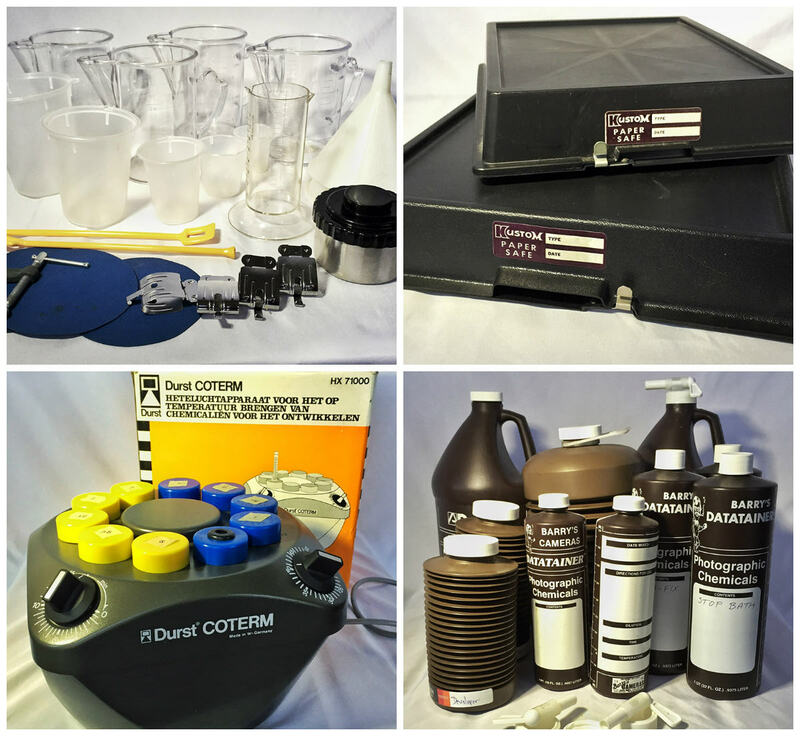 Plenty of links to manuals, too, but virtually no discussion except one mentioning it for keeping E-6 film chemicals at the right temperature. I stopped in at Englewood Camera this morning to drop off some color film from a long hike in Castlewood Canyon that Kate and I took at nearly the height of the fall color. While there, I rooted around in their Big Bin o’ Carriers and, lo and behold, discovered an Omega C760 6×7 negative carrier! The tub of enlarger lenses was next and I found a Rodenstock 105mm f/4.5. Sounds like it’s a little long for printing 6×7 and I may still need to source a 90mm lens. But hey, at least with this I can get started. When I find time, that is.